Editor's Note: This article is Part III of a multi-part series on the kiloWatt exercise and gaming device from PowerGrid Fitness. I am building a hot tub room. 1.) It is a hot tub room. This means there is probably a hot tub in it. Therefore, I am cool; I have a hot tub. 2.) I am manly, because I build things. Hidden in this short little phrase is a third bit of information; at some point, I'm probably going to have to take my shirt off in front of people. In fact, I'd someday like to have girls in my six-person hot tub, preferably like 8 of them, which means that unless I want to revert to my sixth-grade habit of wearing a tee shirt while swimming, I need to look good. And for both their state of mind and my sake of mind, I need to improve my figure a bit. Just in time, my Kilowatt from PowerGrid Fitness, the exercise gaming controller described here in Part I of this series, arrived in the mail. It's now assembled and claiming space in my living room. Friends and neighbors have gathered round. Some of them, I don't even recognize. Soul Caliber II, Metroid Prime 2 and Halo 2 have all taken runs through the system. Everyone's pushed and pulled, and then turned it up to the highest setting and pushed and pulled some more. In preparation, I've been weighed, poked, pinched, and photographed; data collection for before and after review. Body fat percentage, chest and muscle sizes, waistline measurements, all are recorded in unflattering glory. It is almost time to begin. The review will consist of one month of daily Kilowatt use. It will constitute an exploration of what games work best, what genres and what systems, as well as weekly pokes in an effort to discover any developing muscle underneath my flab. In other words, it's the Kilowatt vs. the waistline time of dread. Kilowatt vs. Thanksgiving. Kilowatt vs. Christmas dinner. Kilowatt vs. Blobdom. And the Blobdomness is strong in this one. We'll see how it does. 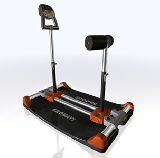 The model I have for review is the Kilowatt Pro, the larger of the two models available from PowerGrid Fitness. In terms of these reviews, any comments I make refer to the Professional version unless I state specifically otherwise. On arrival, the Kilowatt was packed in a cardboard box weighing roughly 92-pounds, and cushioned on the inside with cardboard and plastic sheaths to keep the components from tumbling around during shipping. The Kilowatt itself is surprisingly simple in concept; the entire structure exists for the fundamental purpose of giving the user something to push on really hard without it breaking or you falling over. The electronics of the system, meaning the pressure sensors that measure how hard and in what direction you're pushing while steering, are all located in the head of the unit. This is convenient during moving; the only fragile element of the system, if any of it can be called fragile, is the easily removable three-foot head. The rest of it is simply a platform designed to balance, support, and keep the user in place while strangling the daylights out of the electronic head. It's metal, and it's sturdy. While the planned wireless adaptor is still under development, the Kilowatt Pro includes a cord that surpasses even that of the Xbox, a system well known for its extended cord length, by over a foot. The cord itself splits into four different ends; one for the GameCube, PS1 & 2, Xbox, and a USB plug for attaching to your computer. No drivers are included with the system, which should be recognized automatically by the computer as a control pad under any modern operating system. Details on how well this works will be included in my final review. Assembly took me roughly 49 minutes, an embarrassing admission considering the simplicity of the system. In comparison, breaking it down and re-assembling after I had done it once took less than five or six minutes either way. While 49 minutes is no-where near the 15 minute assembly time PowerGrid Fitness claims on their website, my assembly time fell perfectly within my own expectations. Other things I've tried to assemble out of the box have turned out much worse. The last time I tried to put together one of those pre-manufactured desks, with the pre-drilled holes and packaged screws, it not only took me over two hours, but somehow managed to have a functioning death ray attached where the informational pamphlet said there should have been a bookshelf. After the Kilowatt was assembled, I put on the first game that I could think of, the Xbox title Crimson Skies. The first thing I noticed, before any burn started in my arms, was simply how much fun the controller was. I wasn't the only one to notice this; a number of friends over the course of the next few days spent time on games they hadn't touched for more than three minutes on a regular controller, simply because the experience was so much different with the Kilowatt. It's more like an arcade, now,? was a common comment. Being able to put your full body into a dive bomb on a ground target, or having to strain to pull your plane up at the end of the fall, or any number of other actions, made the experience more fun. Playing on a full-bodied controller such as the Kilowatt changed how the games played, making certain games more fun simply by being plugged in. I've only had the system for a few days and already I can tell you that I wouldn't consider sitting down for a quick jaunt through Crimson Skies with a standard controller. There are better times to be had with the same game standing behind the Kilowatt. Games such as Halo 2 that make more intense use of both left and right analog sticks are fun too. They aren't as out-of-the-box? fun as the games that use predominantly one thumb stick, but after an adjustment time the Kilowatt keeps you in the game on pretty much everything I've thrown at it. Others, like Metroid Prime, work fabulously. It's too early yet to make any declarations about the Kilowatt as a gaming controller or an exercise machine, either one, but I'm thoroughly encouraged by everything I've found so far. Oh, and I was sweating pretty dang quick. I've taken all sorts of measurements in preparation for this review. But what are numbers of muscle mass or body fat percentages to the average person? Sure, there are the before and after pictures, if my editor can force them from me, but they only tell a limited story. What I need, I've decided, are some real world examples of strength for easy, real world comparison. To that end, I've put together a series of less traditional, more demonstrative tests. Let's call them, Matches?. Almost like Olympic trials, only for people like me with no skills. You can see how they went by following the links below, an entertaining read while you're waiting for the full review. If you're as curious as I am about how effective the Kilowatt turns out to be, you'll be waiting for the final review. While I have a few comments up my sleeve right now about how well the system works, you'll have to wait until the full review for the final word. You can expect to see it go live in another two weeks or so, mid-December. On one hand, I want the system to have time to work, if it's going to. On the other, Christmas is coming. Since I think the Kilowatt has the potential to be the perfect Christmas gift for that loved one that might need a bit more exercise and loves games, I want to finish up this series in time for the holiday season. Besides, after Thanksgiving and Christmas, both holidays that traditionally involve a lot of food, we might all need a bit more exercise. With all the holiday game releases, there's a lot of games I'll have to catch up on, too. Seems like a good time to have a Kilowatt around.